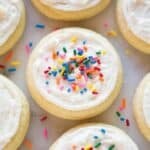 These no-fail, soft and chewy sugar cookies are one of my favorites. Top them with cream cheese frosting or buttercream frosting. In a mixing bowl, cream together the shortening and sugar. Add eggs, milk, and vanilla and mix. In a separate bowl, mix dry ingredients--(flour, baking powder, and salt. Slowly mix dry ingredients into the wet mixture until you form a large dough ball. Lightly flour your counter top. Roll dough ball out until 1/2 inch to 3/4 inch thick. Place cookies on a parchment lined baking sheet. Bake at 350 degrees F for about 7-10 minutes. Cookies will be very light colored and just set, when you take them out. They will harden as they cool, so don't over bake them. Add the butter and cream cheese to a mixing bowl and beat well until smooth and creamy. Add powdered sugar and vanilla. Add more powdered sugar, as needed, until the frosting is smooth and thick and tastes perfect. Yield: The amount of cookies this recipe makes depends on how thick you roll the dough and the size of the cookie cutter you use. It should make at least 12-15 good-size sugar cookies.